Written by Carl Foreman and superbly directed by Fred Zinnemann, this 1952 groundbreaking western is one of the greatest showdowns in cinema history. In 1989, High Noon was selected for preservation in the United States National Film Registry by the Library of Congress as being "culturally, historically, or aesthetically significant” and the film is ranked #27 on the American Film Institute's list of great films. Gary Cooper won the Oscar for Best Actor in this classic tale of a lawman who stands alone to defend a town of cowardly citizens against a gang of killers seeking revenge. The suspenseful story unfolds in approximate real time (from 10:40 a.m. to high noon in an 84-minute film), and many interpreted Foreman's drama as an allegorical reflection of apathy and passive acceptance of Senator Joseph McCarthy's anticommunist campaign. Political underpinnings aside, this remains a milestone of its genre. Like most works of art, it is simple - simple in the structure of its plot and comparatively simple in the layout of its fundamental issues and morals. Plot wise, it is the story of a sheriff in a small Western town, on the day of his scheduled retirement, faced with a terrible ordeal. 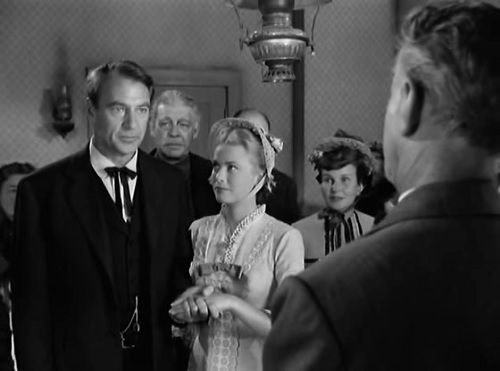 William “Will” Kane (Gary Cooper), the longtime marshal of Hadleyville, New Mexico Territory, has just married pacifist Quaker Amy Fowler (Grace Kelly) and turned in his badge. He intends to become a storekeeper elsewhere. Suddenly, the town learns that Frank Miller (Ian MacDonald), a criminal whom Kane brought to justice, is due to arrive on the noon train. The bad man has got a pardon from a rap on which the sheriff sent him up, and the sheriff knows that the killer is coming back to town to get him. Will and Amy leave town, but fearing that the gang will hunt him down and be a danger to the townspeople, Will turns back. He reclaims his badge and scours the town for help, even interrupting Sunday church services, with little success. His deputy, Harvey Pell (Lloyd Bridges) resigns because Will did not recommend him as the new marshal. Harvey agrees to stay if Will supports him, but Will refuses to buy his assistance. Will goes to warn Helen Ramírez (Katy Jurado), first Miller’s lover, then Will's, and now Harvey's. Helen is already aware of what Miller will do to her if he finds her and has sold her business. 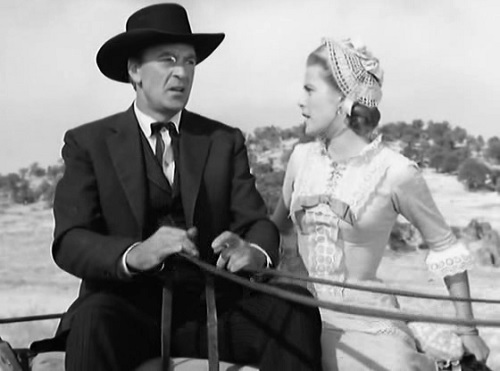 She prepares to leave town to avoid Miller but also to avoid seeing Kane killed. Amy gives Will an ultimatum: she is leaving on the noon train, with or without him. Nobody in town is willing to help him. Everybody has some kind of excuse. Martin (Lon Chaney Jr.), the retired town marshal, says he can’t assist Kane because of his arthritis and complains, “People got to talk themselves into law and order before they do anything about it, maybe because deep down they don’t care. They just don’t care.” Harv Pell (Lloyd Bridges) won’t help him because of a jealous intuition that Kane has feelings for his girlfriend, Helen Ramirez (Katy Jurado), and vice versa. The town judge (Otto Kruger), who sent Miller to prison, hurriedly leaves town and takes the city hall American flag with him, thus stripping the town of all its democracy. 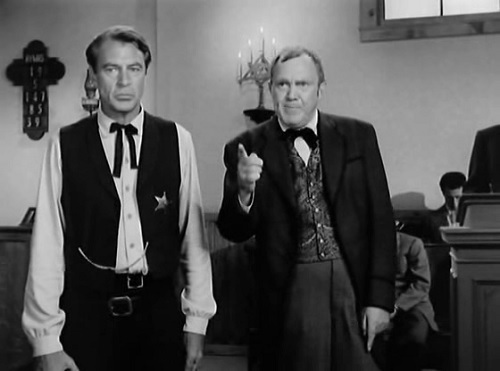 Mayor Henderson (Thomas Mitchell) deprives Kane of any possible allies by seducing an audience of churchgoers with a speech about how blood in the streets might do significant damage to the town’s economy and tourism. Even Amy turns her back on Kane; both her father and her brother were casualties of gun violence and, as a Quaker, she refuses to stand by her husband as long as he continues to fight. The sheriff who preceded Will supports him, but is too old to help and tells Will to get out of town. Some even desire to see Kane's probable demise. Here is the first important question: shall the sheriff slip away, as his new wife and several decent citizens have done, or shall he face, here and now, the crisis which he knows he can never escape? And once he has answered this question, the second and greater problem is the maintenance of his resolution as noon approaches and he finds himself alone- one man, without a single sidekick, against a killer and three attendant thugs; one man who has the courage to take on a perilous, righteous job. How Mr. Foreman has surrounded this simple and forceful tale with tremendous dramatic implications is a thing we can't glibly state in words. It is a matter of skill in movie writing, but, more than that, it is the putting down, in terms of visually simplified images, a pattern of poetic ideas. And how Mr. Zinnemann has transmitted this pattern in pictorial terms is something which we can only urge you to go yourself to see. One sample worth framing, however, is the brilliant assembly of shots that holds the tale in taut suspension just before the fatal hour of noon. The issues have been established, the townsfolk have fallen away, and the sheriff, alone with his destiny, has sat down at his desk to wait. Over his shoulder, Mr. Zinnemann shows us a white sheet of paper on which is scrawled “last will and testament” by a slowly moving pen. Then he gives us a shot (oft repeated) of the pendulum of the clock, and then a shot looking off into the distance of the prairie down the empty railroad tracks. 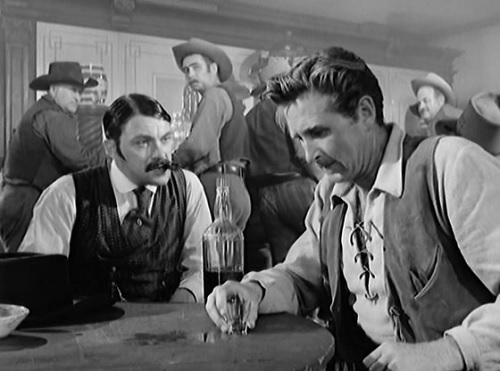 In quick succession, then he shows us the tense faces of men waiting in the church and in the local saloon, the still streets outside, the three thugs waiting at the station, the tracks again, the wife of the sheriff waiting, and the face of the sheriff himself. Then, suddenly, away in the distance, there is the whistle of the train and, looking down the tracks again, he shows us a wisp of smoke from the approaching train. In a style of consummate realism, Mr. Zinnemann has done a splendid job. And so has the cast, under his direction. Mr. Cooper is at the top of his form in a type of role that has trickled like water off his back for years. 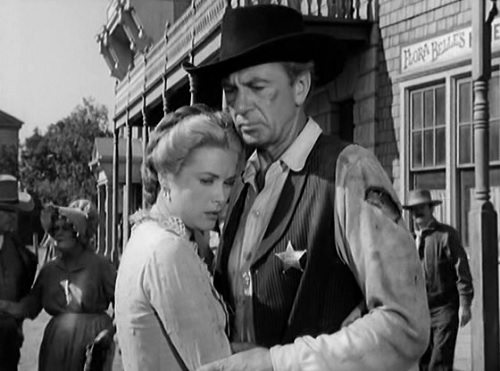 And Lloyd Bridges as a vengeful young deputy, Katy Jurado as a Mexican adventuress, Thomas Mitchell as a prudent townsman, Otto Kruger as a craven judge, and Grace Kelly as the new wife of the sheriff are the best of many in key roles. The vanguard direction by Fred Zinnemann was nothing short of brilliant. Zinnemann eschewed the Western formula and struck out in a completely different direction. He chose black and white to give it a stark look. The sky was overcast rather than sunny and blue. The entire film was shot for only $700,000 (an extremely small sum even for 1952) almost completely on a studio lot. This was the first Western, (and possibly the first film) to tell a story in real time (the story transpires in roughly the same amount of time as the length of the film). The villainous Frank Miller (Ian MacDonald) was known only through dialogue and he did not actually appear until the end of the film. Zinnemann hung the pall of Miller ominously in the air like an evil spirit who was feared but unseen. This made the villain bigger than life and added to the suspense. 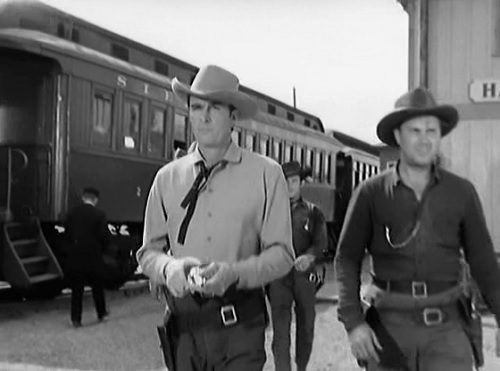 Even when Miller finally arrived on the noon train, Zinnemann didn’t let us see his face for a full two or three minutes, showing him strapping on his guns from behind and talking to his gang. Finally, there was no action until the very end of the film. What is important is that someone - or all of them together, we would say - has turned out a Western drama that is the best of its kind in several years. Familiar but far from conventional in the fabric of story and theme and marked by a sure illumination of human character, this tale of a brave and stubborn sheriff in a town full of do- nothings and cowards has the rhythm and roll of a ballad spun in pictorial terms. And, over all, it has a stunning comprehension of that thing we call courage in a man and the thorniness of being courageous in a world of bullies and poltroons.